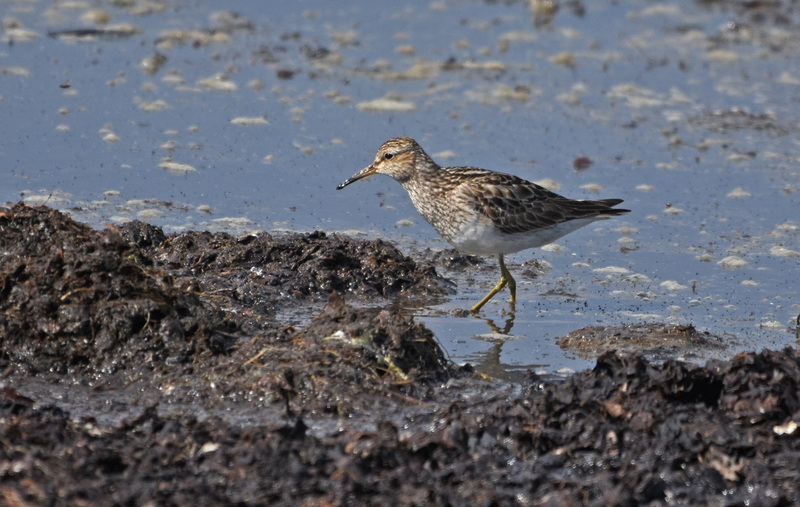 The bad weather with wind and rain yesterday brought an increase of waders to Revtangen. We put out 9 walk-in traps from 9-19, and also 7 clapnets for a few hours. Despite lots of disturbance from walkers and photographers we still managed a good catch. Ringed: Bar-tailed Godwit 10, Common Ringed Plover 4, Dunlin 273, Sanderling 6, Curlew Sandpiper 1, Little Stint 3, Red Knot 6, Redshank 1, Turnstone 12, Rock Pipit 2, Common Starling 4. Ringmerket: Lappspove 10, sandlo 4, myrsnipe 273, sandløper 6, tundrasnipe 1, dvergsnipe 3, polarsnipe 6, rødstilk 1, steinvender 12, skjærpiplerke 2, stær 4. Total = 322. An adult Pectoral Sandpiper frequented the trapping area today, but not the walk-in traps......Alaskasnipe.